"Better economize in the purchasing of furniture or carpets than scrimp in buying good books or papers. "Our sitting-rooms need never be empty of guests or our libraries of society if the company of good books is admitted to them." 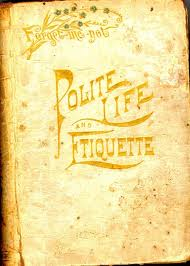 Benham, Georgene Corry: Polite Life or What is Right in Etiquette and The Social Arts. Illustrated. Copyright 1895 by Robt. O. Law. A book in my collection written for "the ladies and gentlemen, boys and girls of America." The 1891 edition is available in digital text: from Google books.